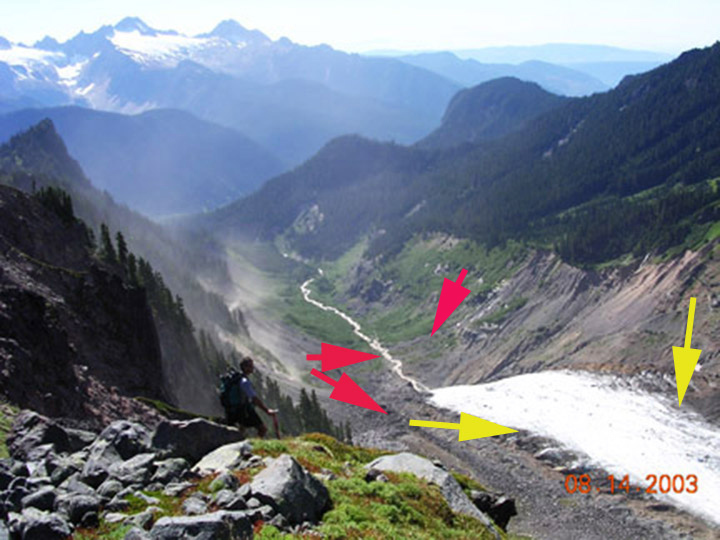 From 1984-2014 we have monitored the mass balance of the Rainbow Glacier on Mount Baker, North Cascade Range, Washington. This entails detailed monitoring of snowpack depth in July and August, and subsequent ablation to the end of the melt season. On July 13th the glacier was completely snowcovered. 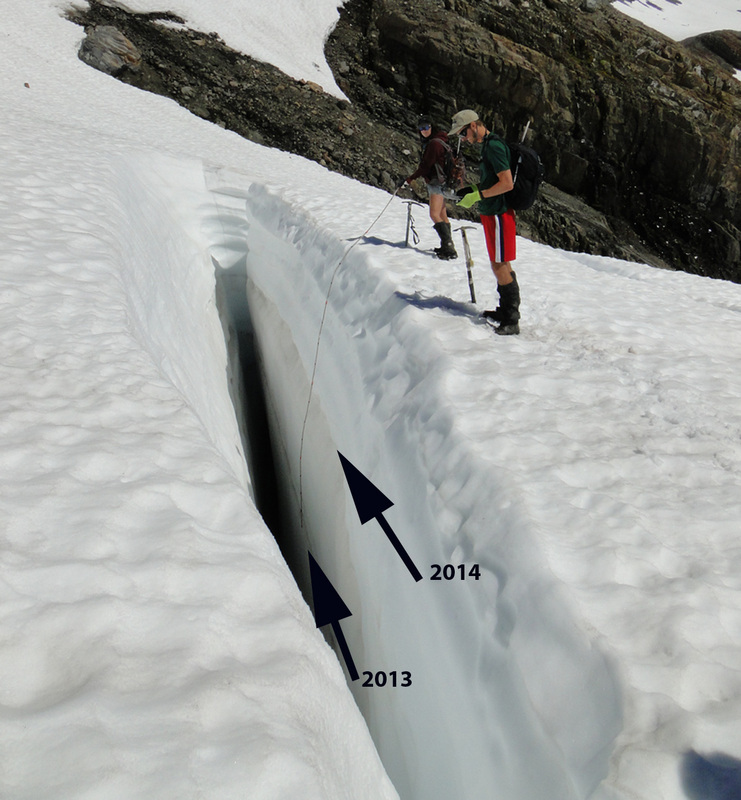 By August 10th the snowline had risen to 1575 m, with 1.4 m of ablation since July 13th. 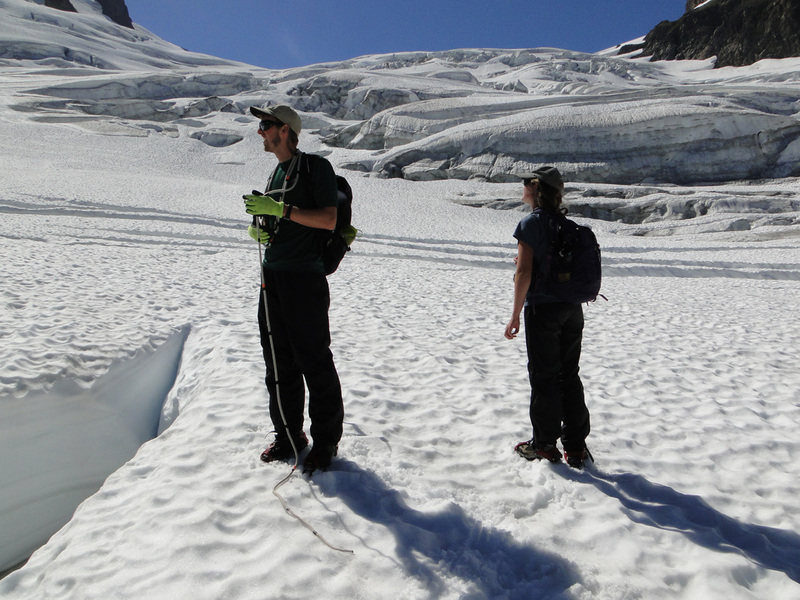 We measured the snowdepth at 85 locations on the glacier, with only 6 measurements exceeding 3.5 m on Aug. 10th. Ben Pelto and Ashley Edwards examining crevasse stratigraphy both the 2013 and 2014 layers evident. 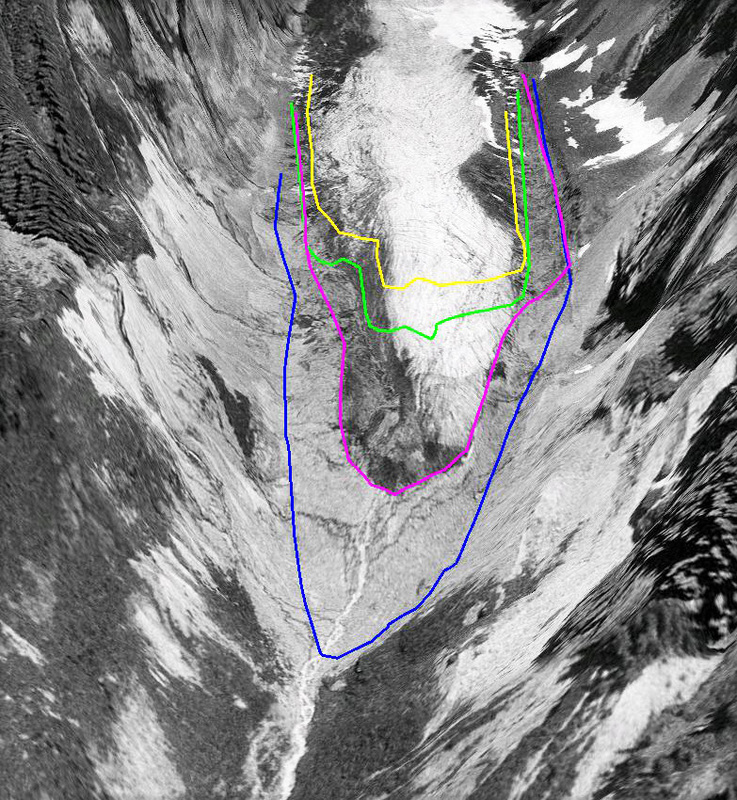 Limited snowpack below the main icefall at 1750 m on Aug. 10. By September 27th the snowline had risen to 1975 m with a few pockets of snow retained where the snowdepth had exceeded 3.2 m on Aug. 10th. Snowdepth at the Sept. 27th snowline had been 3.0 to 3.2 m on Aug. 10th. This indicated ablation of approximately 3 m of snowpack, 1.8 m of water equivalent from Aug. 10th to Sept. 27th. Ablation from July 13th to Sept. 27th was 5.3 m of snowpack and 3.2 m w.e. This was 5-10% more ablation than any other year since 1984. 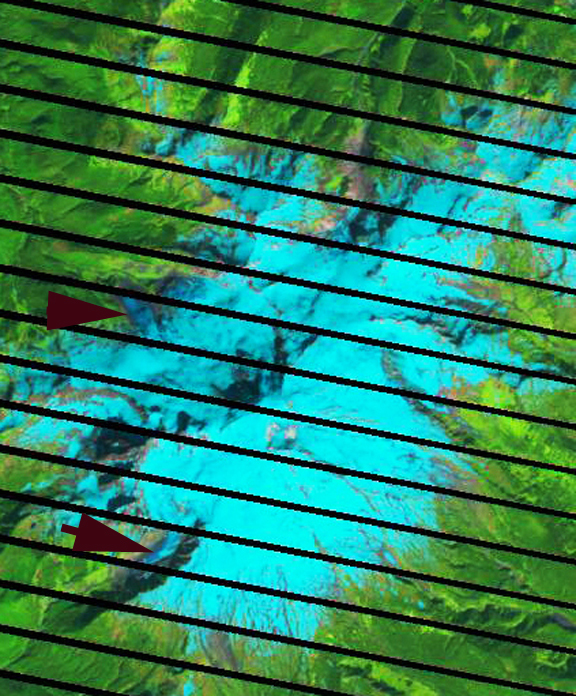 A comparison of images from the ground on Aug. 10th indicates the snowpack on the glacier from 1550-1950 m, the blue arrows indicate locations where a patch of 2014 snow remained on Sept. 27th. The Sept. 27th image was taken by Tom Hammond from Rainbow Ridge the only location where the whole glacier can be viewed. The firn is simply old snow that survived a summer and could be from 2012 or 2013. Winter snowpack was normal on Mount Baker, the record ablation then led to a large negative mass balance for the glacier of -1.8 m, but not a record loss. The ablation did lead to many significant surface streams on the glacier shown below, which drain into the glacier at moulins. The terminus of glacier retreated rapidly from 1984 to 1998, but has slowed as it currently is in an avalanche runout zone. We visited the terminus in 1984 and all retreat is measured from that point when the glacier was in contact with an advance moraine from the 1955-1980 period of advance. A comparison of 1993 and 2006 Google Earth images indicates the retreat, red outline 2006 margin and black outline 1993. The 2014 image taken by Tom Hammond indicates that the terminus did get exposed in 2014 which will lead to additional retreat when we measure the terminus position next summer. Total retreat from 1984 to 2014 is 490 m.
2006 Google Earth view of terminus. Picture of the terminus in 2014 indicating the 214 and 1984 position. Taken by Tom Hammond from Rainbow Ridge. If glaciers did not change in response to climate, we would not have to think about their role in water resources in the watersheds that they reside. 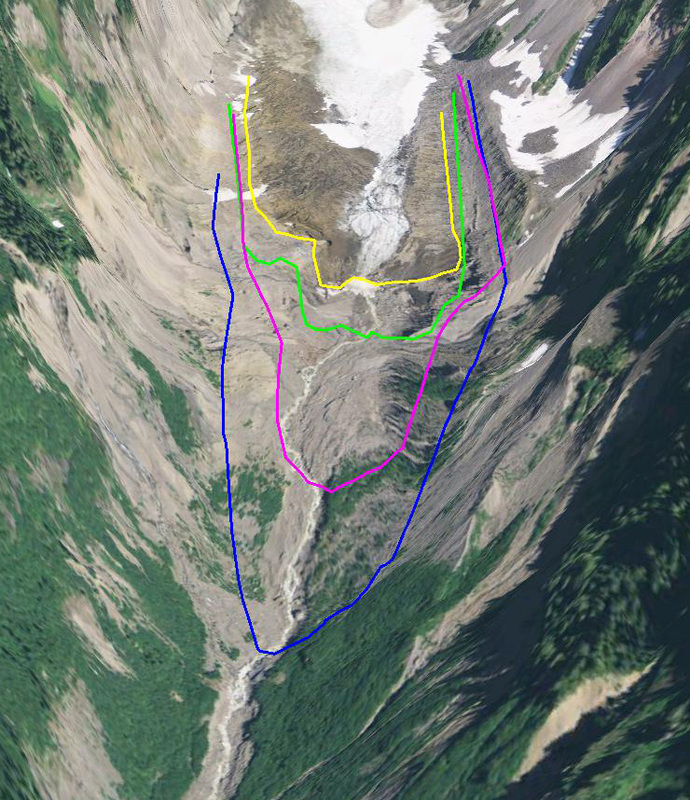 During the last two years in an ongoing study with the Nooksack Indian Tribe we have been working on quantifying the role glaciers play in that watershed. Glaciers comprise the headwaters of the Nooksack River and are a critical source of summer discharge and greatly influence summer stream temperatures. There are nine species of salmon in the watershed that the Nooksack Indian Tribe depends on for cultural, subsistence, and economic uses. Climate change is an additional new threat to salmon that has caused and will continue to cause an increase in winter flow, decreased summer baseflow, and increased summer water temperatures. This post will focus on the changing impact of glaciers on streamflow and the evolving water temperature threat. The Nooksack River watershed has three significant watersheds, South Fork, Middle Fork and North Fork. The South Fork has no glaciers, the Middle Fork has four significant glaciers and 2% of the watershed area above the USGS gage is glaciated. The North Fork has 12 significant glaciers that cover 6% of the watershed area above the USGS gage. 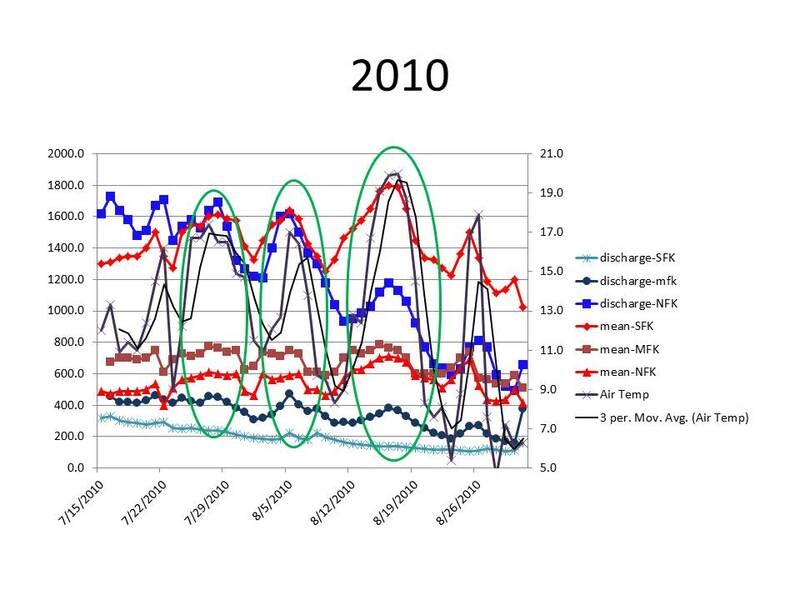 Here we examine stream discharge and water temperature at USGS gages on each stream to illustrate the different response to 12 warm weather events during the summers of 2009, 2010, 2012 and 2013. During each of these periods we have along with Oliver Grah and Jezra Beaulieu, working for the Nooksack Tribe, have been observing the ablation and runoff directly from the glaciers. The largest area of glaciers are those on Mount Baker, a strato volcano that is the highest mountain in the North Cascades. 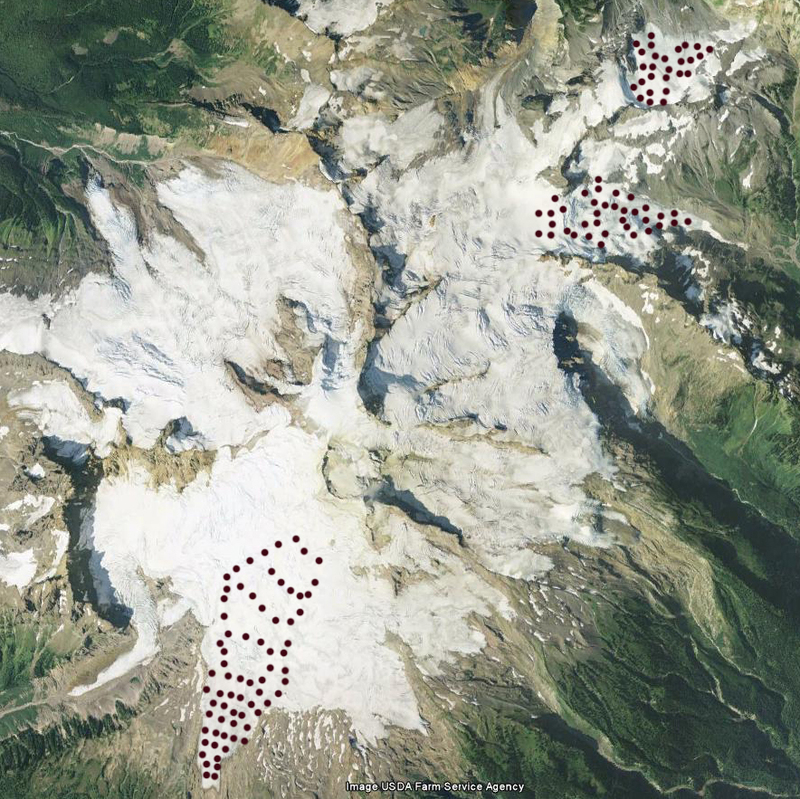 Pelto and Brown (2012) note that terminus observations on the nine principal Mount Baker glaciers, 1984–2009, indicate retreat ranging from 240 to 520 m, with a mean of 370 m or 14 m/year. Pelto and Brown (2012) observed that this is the result of a sustained mass balance loss averaging -0.5 m/year during the 1990-2010 period. This equates to an 11-m loss in glacier thickness, 12–20% of the entire 1990 volume of glaciers on Mount Baker. 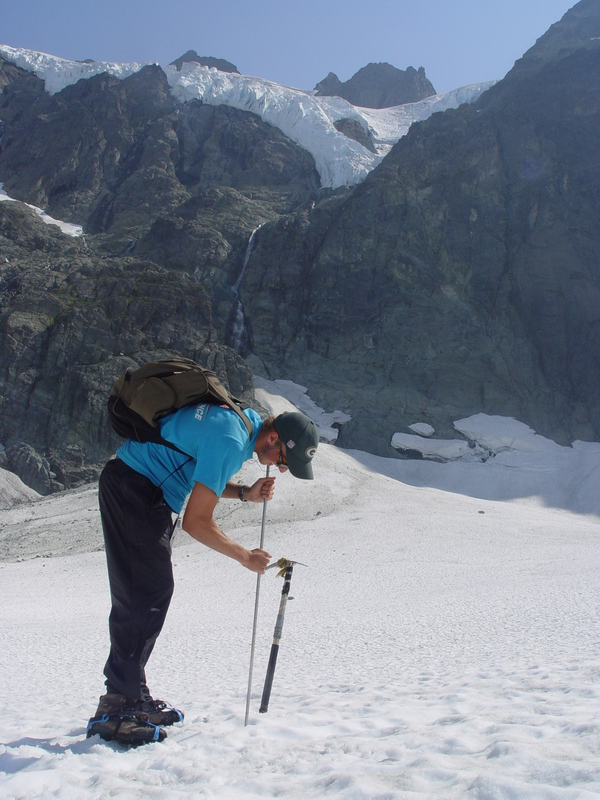 This summer we will for the 31st consecutive year be measuring glacier mass balance on Mount Baker. During each of these events ablation was measured on glaciers in the basin. 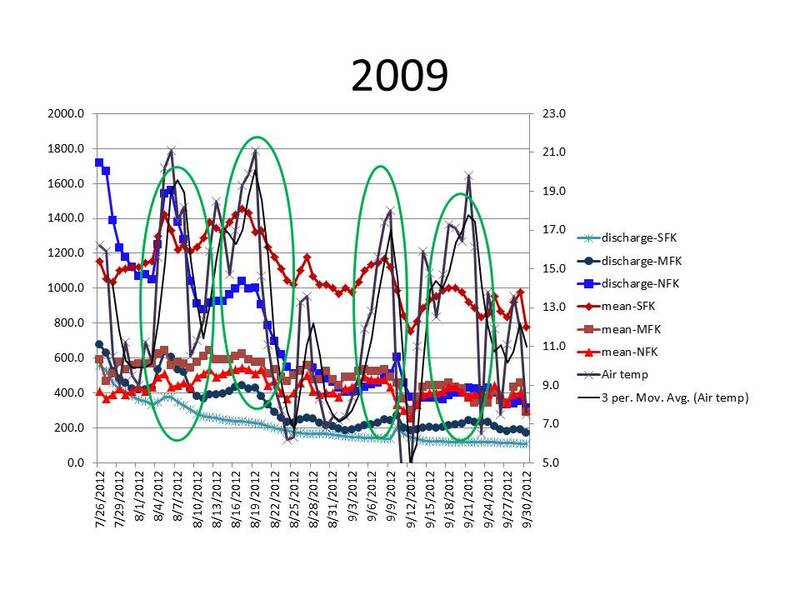 For stream discharge, a 10% increase is set as the key threshold for significant response to each warm weather event. For the North Fork 10 of 12 warm weather events exceeded the limit, in the Middle Fork 4 of 12 events had a significant response and for the South Fork none of the 12 events led to a 10% flow increase. It is apparent that warm weather events increase glacier melt, thus enhancing flow in the North Fork. In a basin without glacier runoff the hydrologic system consistently experiences reduced discharge. For water temperature, an increase of 2° C is the threshold of significance used for response to warm weather events. In each the North Fork and Middle Fork, 2 of 12 events exceeded this threshold, and for the South Fork 12 of 12 events exceeded this threshold, each event is a green ellipse on the charts below. Warm weather events consistently generate a significant increase in stream water temperature only in the non-glaciated South Fork Basin. 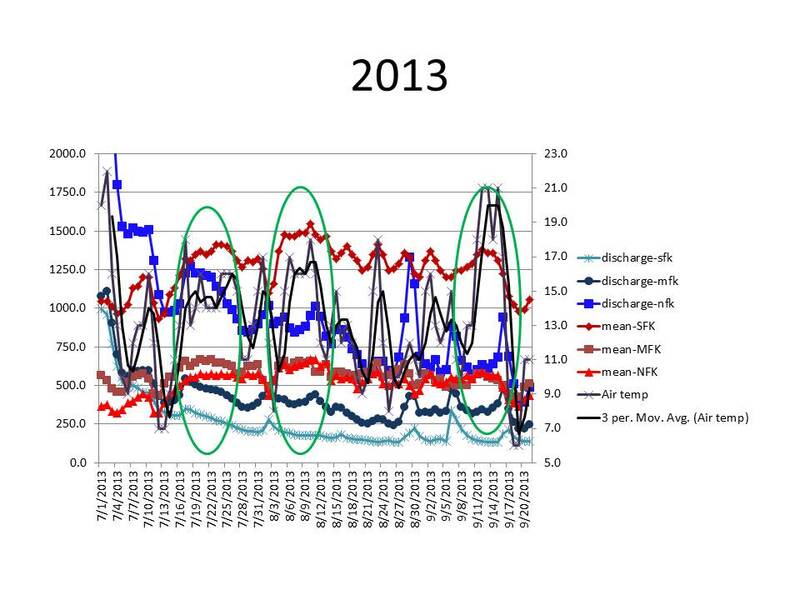 During 6 of these 12 warm events, runoff measurements below Sholes Glacier and ablation measurements on Sholes and Easton Glacier indicate daily ablation ranging from 0.05-0.06 meters per day, which for the North Fork currently yields 9.5-11 m3/second. This is 40-50% of the August mean discharge of 24 m3/second, despite glaciers only covering 6% of the watershed. 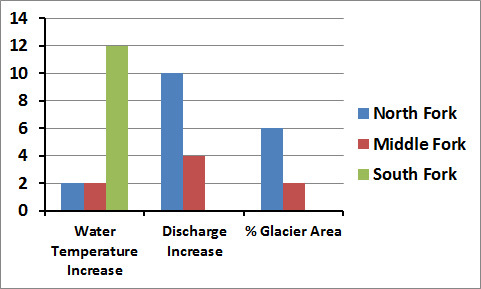 Increased glacier discharge largely offset the impact of increased air temperature on stream water temperature during the warm weather events. 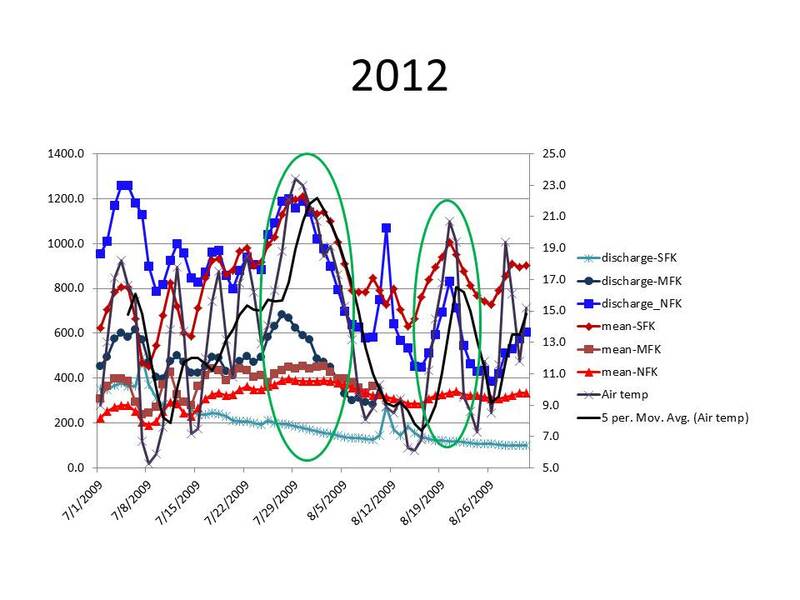 In the charts below note the red line with diamond markers that is the South Fork stream temperature and the top brightest blue line that is North Fork discharge and what happens during the warm events, green ellipses. Also note the South Fork discharge bottom blue line does not respond nor does the North Fork stream temperature red line with triangles. 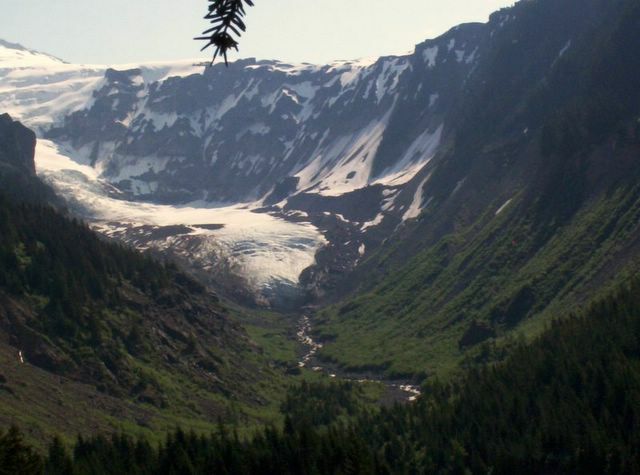 As the glaciers continue to retreat the North Fork will trend first toward the more limited impact of the Middle Fork and then the highly sensitive South Fork where warm weather leads to declining streamflow and warming temperatures. This will lead to a situation similar to the Skykomish River where the number of low flow days has sharply increased. The retreating glaciers include the Sholes, Roosevelt,Deming and Mazama. Roosevelt Glacier is on the northwest side of Mount Baker, Washington with its accumulation zone joined with the Coleman Glacier. My first visit to Roosevelt Glacier was in 1984, when the glacier had just completed a 30 year period of advance from 1949-1979. 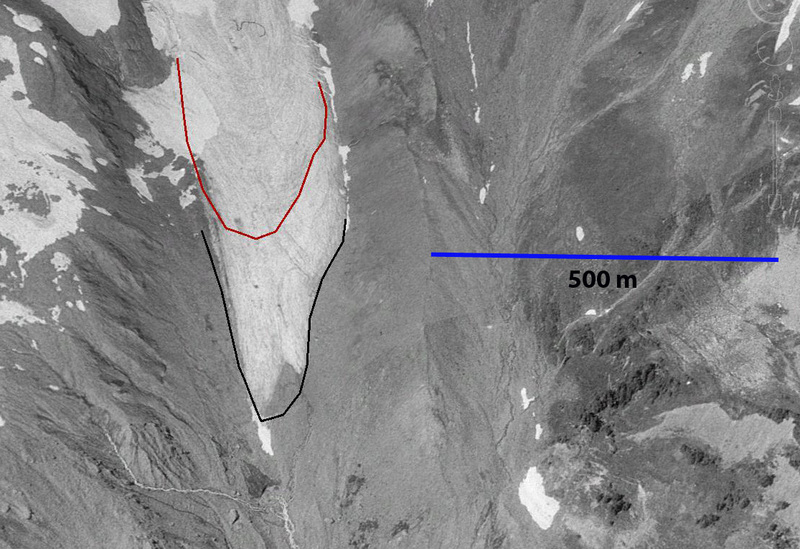 Since 1979 the glacier has been retreating, image below. 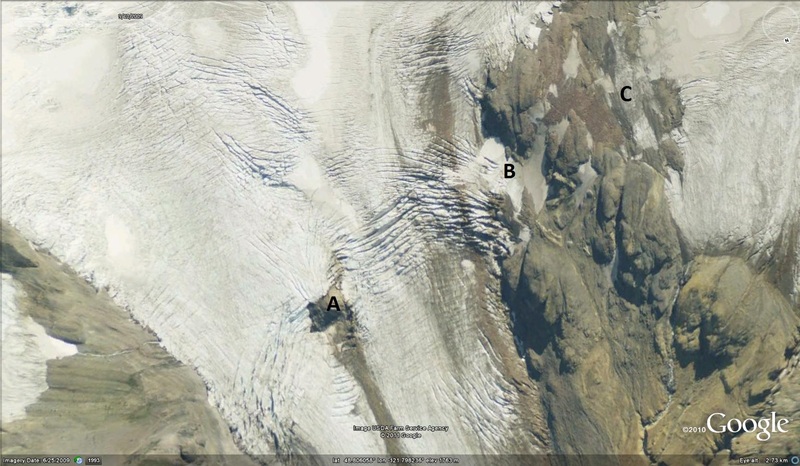 This post examines Google Earth imagery from 1993, 2003 and 2009 along with field observations from the glacier. 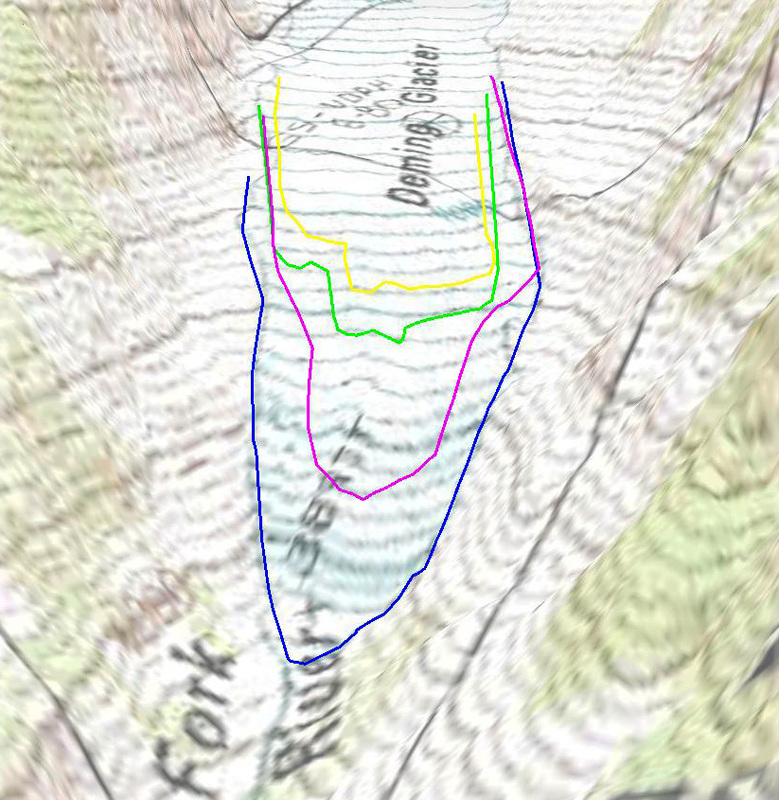 The purple line indicates the advance moraine that the glacier emplaced during the 1949-1979 period of advance. We mapped the location of this moraine in 1985, when it was still recent and very evident. The red line is from 1993, yellow line from 2003 and green line from 2009. In 1993 the area below the lip of lava flow cliff is thin and stagnant, cliff noted by purple arrow. By 2003 the glacier has retreated to the top of the cliff and by 2009 the glacier has pulled back from the edge of the cliff. 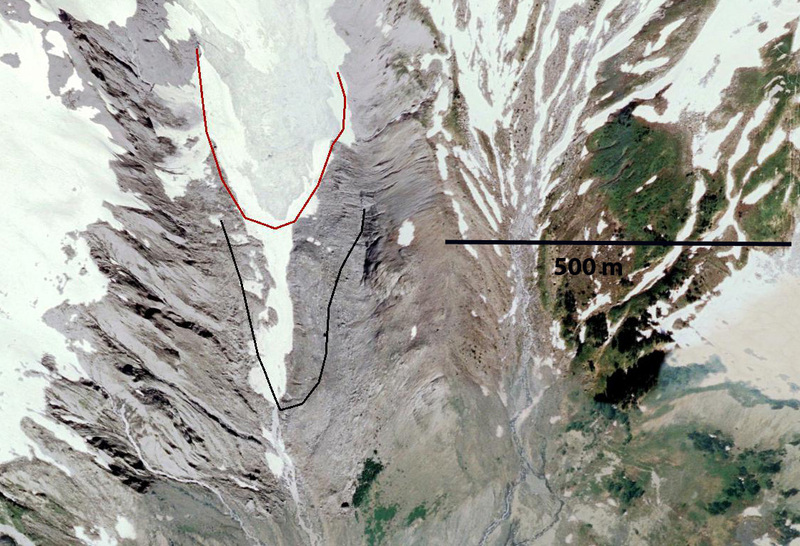 By 2012 the lower glacier, viewed from the edge of the Coleman Glacier, is thin and uncrevassed in the lower 350 meters of the glacier, up to the red arrow. The glacier retreated 190 meters from 1979 to 1993 and 220 meters from 1993 to 2009. The rate of 14 m/year has been relatively consistent. 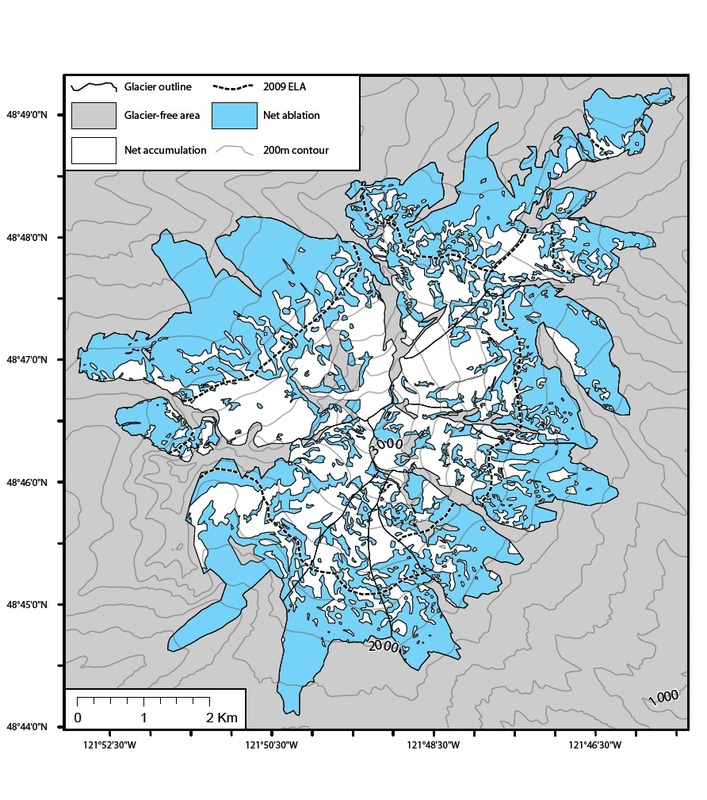 The glacier is fed by three principal accumulation zones: 1) A glacier tongue that descends from the summit plateau at 3200 meters, 2) an avalanche fed and direct snowfall region beneath the north ridge, at 2200 meters 3) an avalanche and direct snowfall fed region beneath the northwest face, at 2400 meters. The annual snowline has averaged 2150 meters on Roosevelt Glacier from 1984-2010, which has led to a similar retreat of 14 m/year and mass balance loss -0.52 m/year of all Mount Baker glaciers, Pelto and Brown (2012). 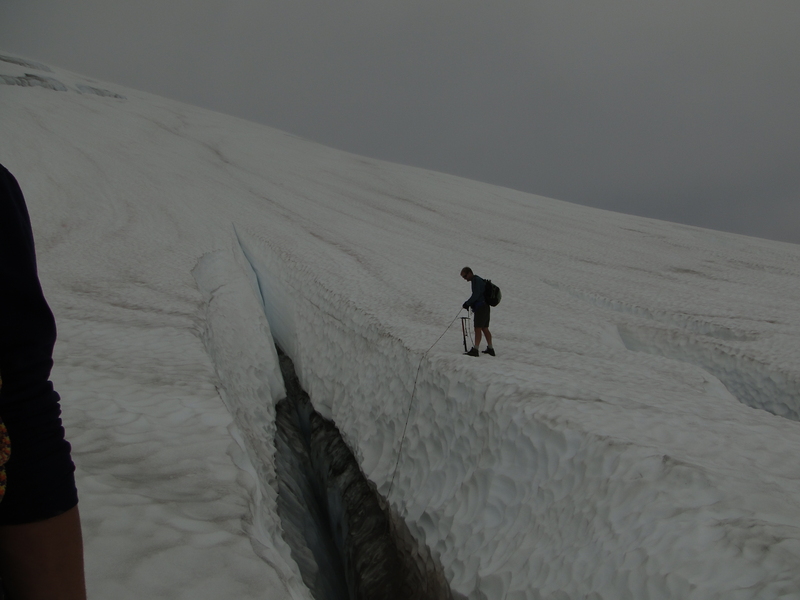 Each summer we investigate the retained snow depth retained in the crevasse stratified exposures on Mount Baker in the 2400 meter range. Below are several images from this investigation. 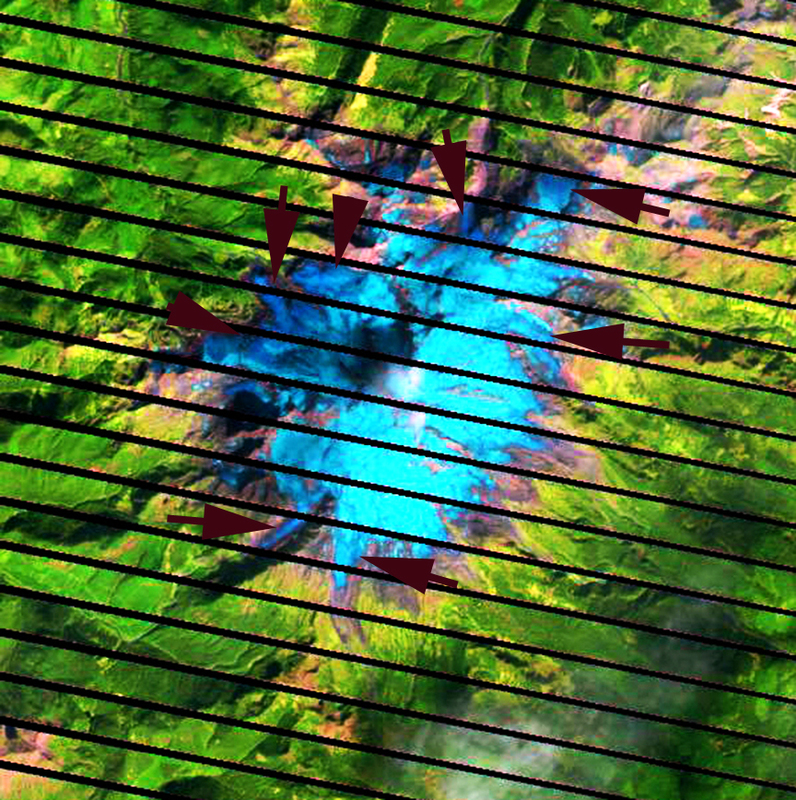 In the second image the magenta arrows indicate specific annual layers that have been retained. Typical thicknesses are 1.75 to 2.25 m. The next two images are from when we are in an icefall looking for the best exposure to measure the annual layer stratigraphic thickness. 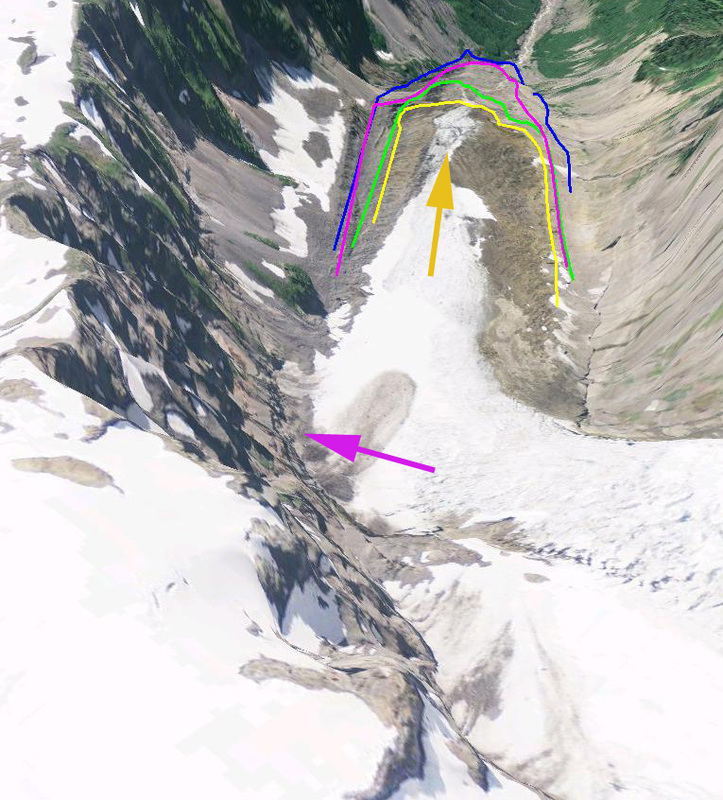 The behavior of this glacier parallels that of Deming Glacier, Boulder Glacier and Rainbow Glacier all on Mount Baker. 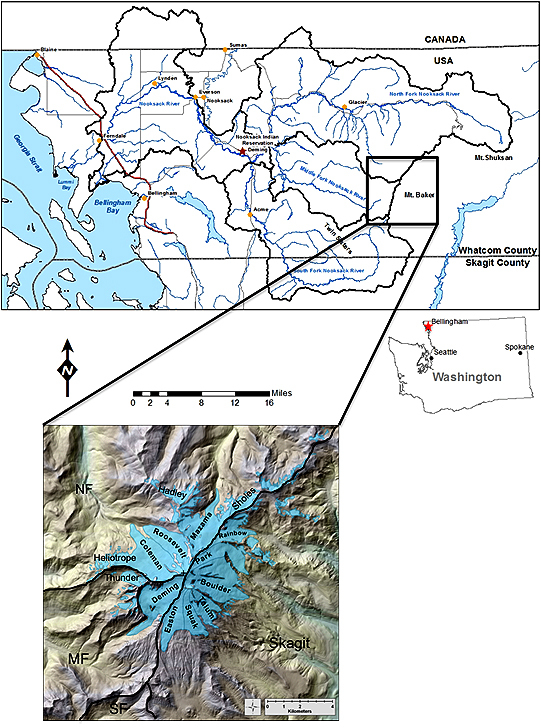 Just published in Hydrologic Process is a paper from our 28 years of research on Mount Baker. “Mass Balance Loss of Mount Baker, Washington glaciers 1990-2010” Mass balance is really the annual bank account for the glacier. Deposits are snow accumulation, withdraws are melting. A glacier that has greater income has a positive mass balance and increases in volume. Greater melting leads to losses in volume. 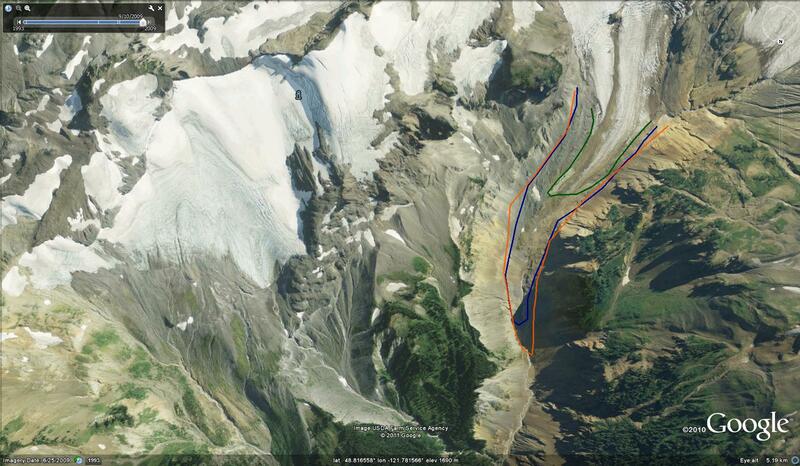 Mount Baker,North Cascades, WA has a current glacierized area of 38.6km2. 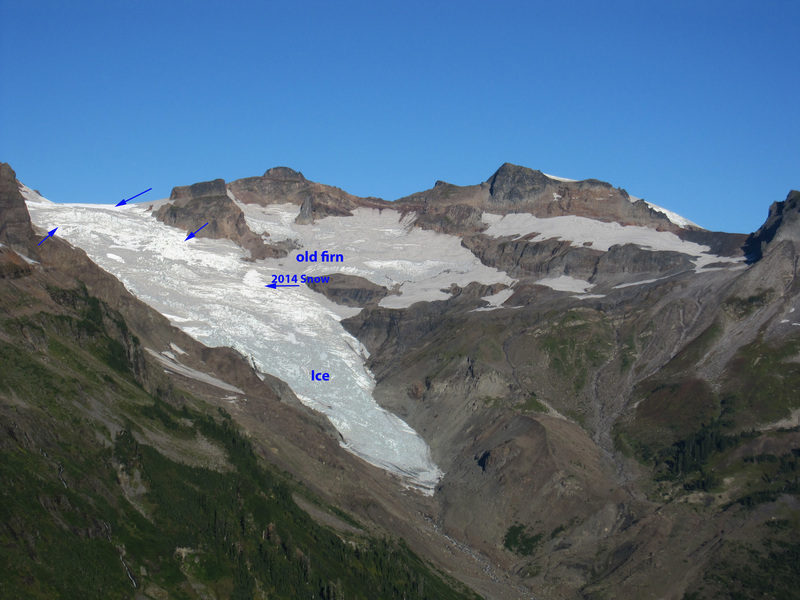 From1984 to 2010, the North Cascade Glacier Climate Project has monitored the annual mass balance (Ba), accumulation area ratio (AAR), terminus behaviour and longitudinal profiles of Mount Baker glaciers. The Ba on Rainbow, Easton and Sholes Glaciers from 1990 to 2010 averaged 0.52mw.e. a1(m a1). a mean Ba of 0.77m/year from 1990 to 2010. All but one estimate converge on a loss of 0.5m/year for Mount Baker from 1990 to 2010. This equates to an 11-m loss in glacier thickness, 12–20% of the entire 1990 volume of glaciers on Mount Baker. The two key measures of mass balance, which is direct measurements and measuring the snow covered fraction of the glacier at the end of the year, the accumulation area ratio. Below is the 2009 map of the snowcovered areas put together by Courtenay Brown, Simon Fraser University. This same year we were in the field and took measurements at the burgundy dots, in the second image. Each dot is worth three measurements. In two weeks we will adding more measurements to this data set for 2012. We do this largely by using a probe that can be driven through the snowpack from last winter, or in crevasses where the annual layering is evident like tree rings. The contrast between the snowpack distribution in September 2009 and 2011 is evident. The burgundy arrows point out bare ice regions. In 2009 the bare ice extent darker blue, was much larger than in 2011, when snowcover was quite good. The net trend over the last 20 years of mass balance loss is leading to the ongoing retreat of all Mount Baker glaciers. 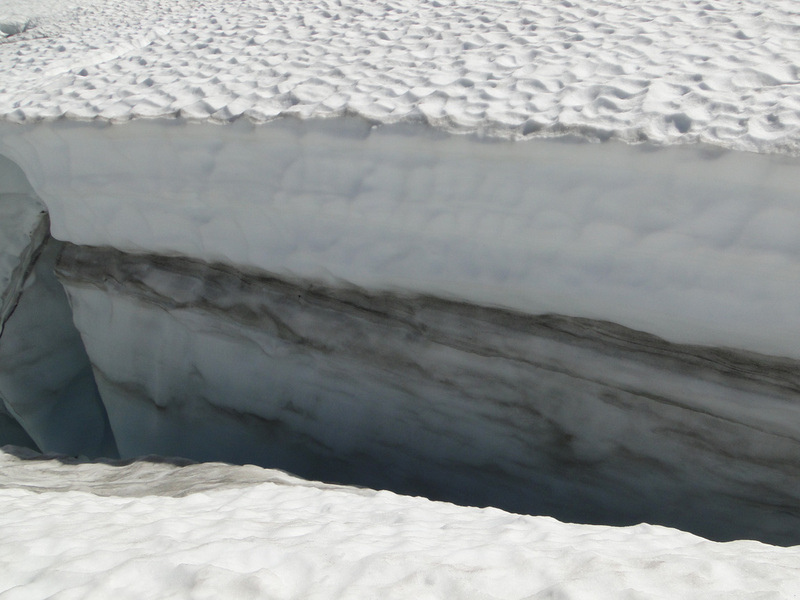 The reduction in width and crevassing in the Deming Glacier Icefall indicates a reduced flow into the terminus reach of the Deming Glacier. 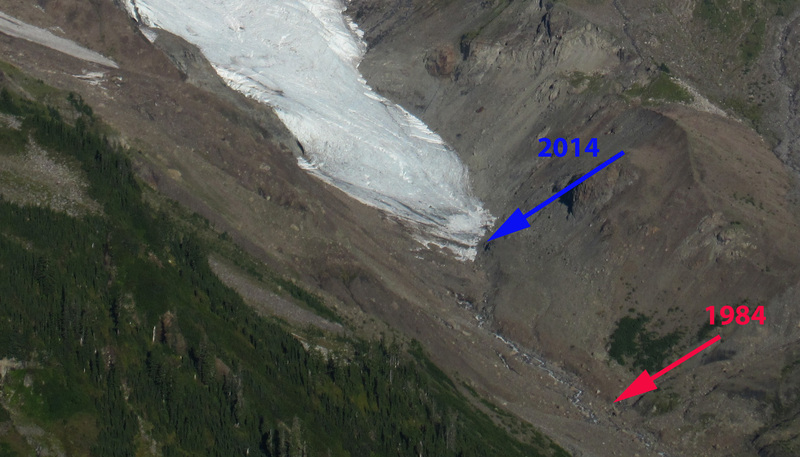 This post examines the retreat of the Deming Glacier from 1984-2010. The glacier has retreated significantly as have all 47 glaciers we observe in the field. 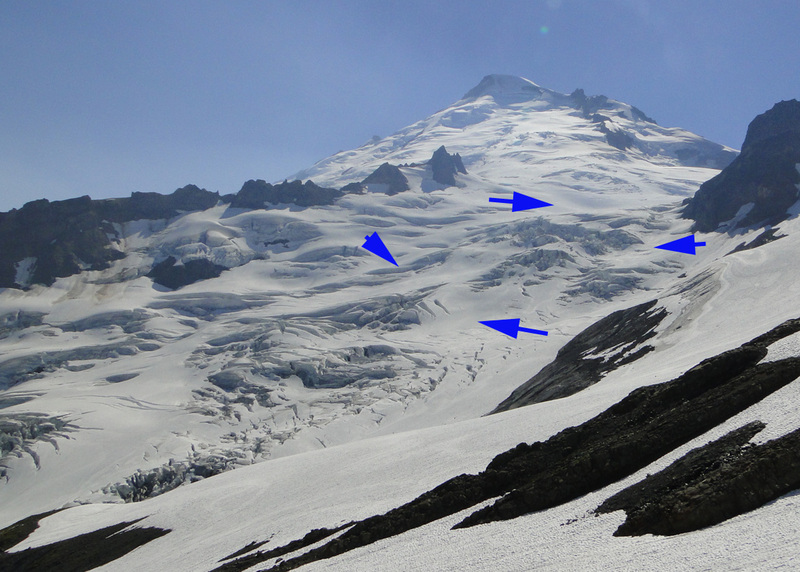 The retreat parallels that of other Mount Baker glaciers, Boulder Glacier and Easton Glacier (Pelto,2006). Each year since 1990 we have been able to observe the terminus of the Deming Glacier from afar at our survey point. Only in two years have we actually visited the terminus 1996 and 2002. The latter proved hazardous enough to discourage further attempts. Deming Glacier advanced dramatically during the 1950’s and did not retreat substantially until the late 1980’s. The first set of images are from the survey point in 2003, 2006, 2007, 2008 and 2010. 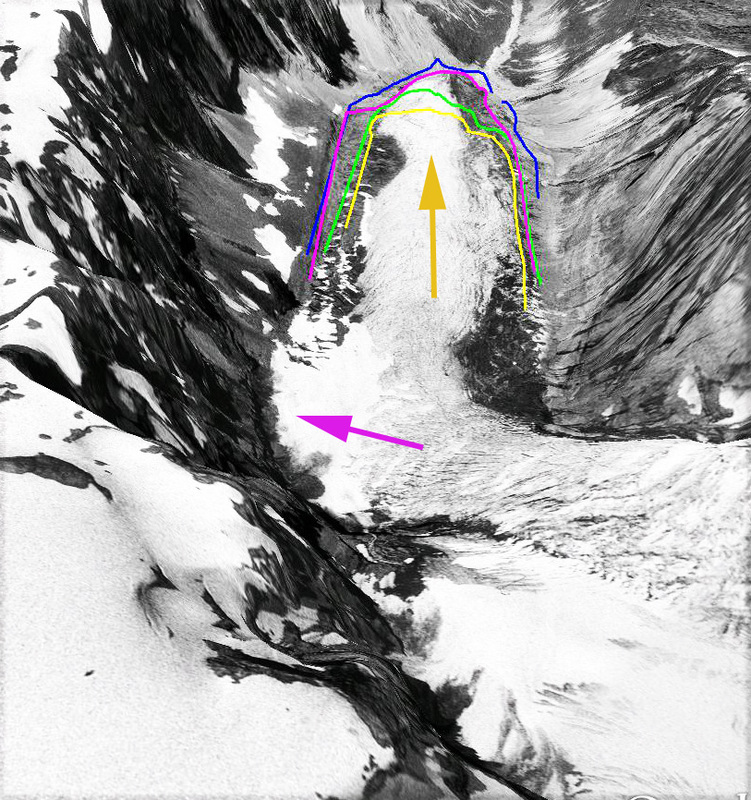 The yellow arrows indicate the narrowing of the debris free section of ice in the middle of the glacier. The red arrows indicate the moraines from the advance ending around 1980 including the lateral moraines and two sets of terminal moraines. The closer set of terminal moraines is where the glacier ended in 1996 when we visited the glacier. Both the lateral and end moraines are indicated. The stream issuing from the glacier front feeds the Middle Fork Nooksack River, which supplies some of Bellingham, WA water supply. We conducted a . The next set of images include a 1979 Austin Post USGS image from 1979 and the rest are from the Google Earth showing in order the 1984 map position (blue), 1994 terminus (magenta), 2006 terminus (green) and 2011 terminus (yellow). Note similarity of blue line and 1979 terminus. The glacier retreated 160 m from 1984-1994, 16 meters/year. From 1994 to 2006 the glacier retreated 240 m, 20 meters/year. 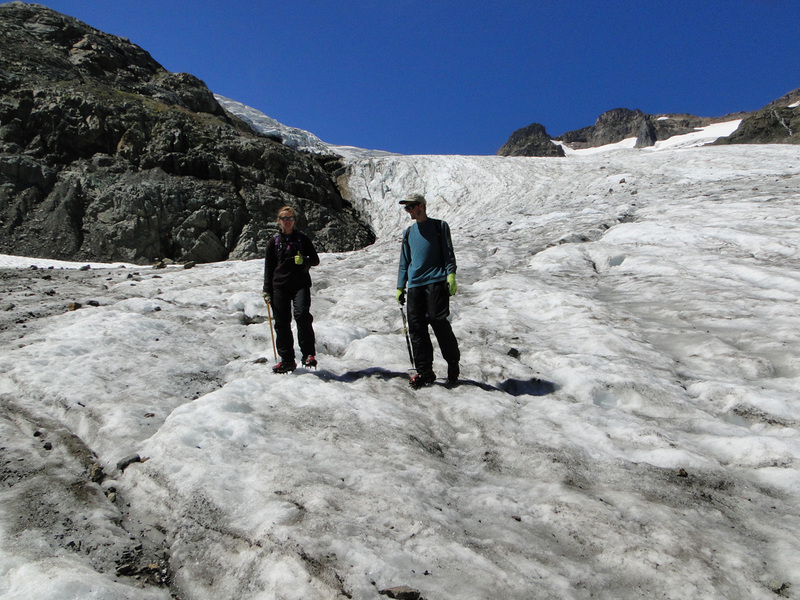 From 2006-2011 the glacier retreated 120 m, a rate of 24 meters/year. The rate is still on the increase. 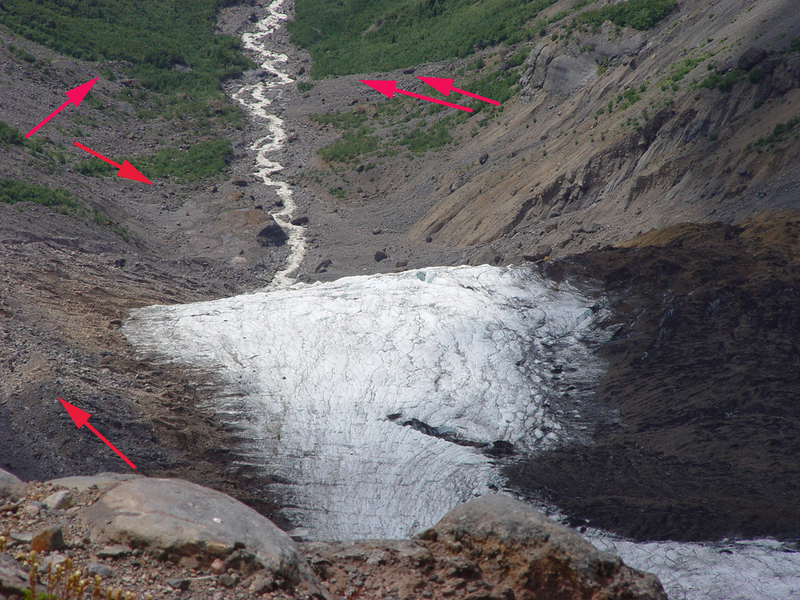 The top image in the sequence below is a view from 2002 showing the end of the glacier (survey point from red X. 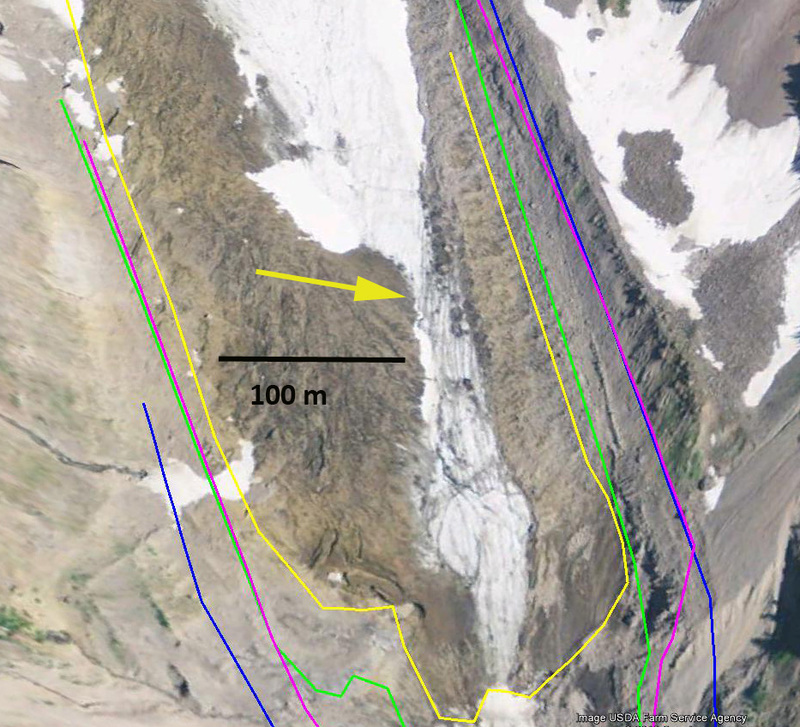 The front was still steep at the time and the width of the debris near the terminus limited, clean ice width is 200 m.. By 2011 the terminus is not nearly as steep and most of the glacier width is debris covered. The view in Google Earth imagery from 1998 and 2011 indicates the change and the survey point is indicated by the red x. The last image is a 2011 closeup view in Google Earth the debris free ice section is 40 meters wide. What is causing the narrowing of the debris free ice is the reduction in velocity, the increased thinning of the clean ice in the center compared to the insulated debris covered ice at the edges. As the elevation difference increases debris slides off the side of the developing debris covered ridge (Pelto, 2001: 35). Mazama Glacier flows down the north side of Mount Baker, a strato volcano in the North Cascades of Washington. The glacier begins at the summit plateau, 3260 meters, and terminates at the head of Wells Creek 1470 meters. This is a glacier we visit briefly each summer since 1984, but is not a focus of detailed observations. 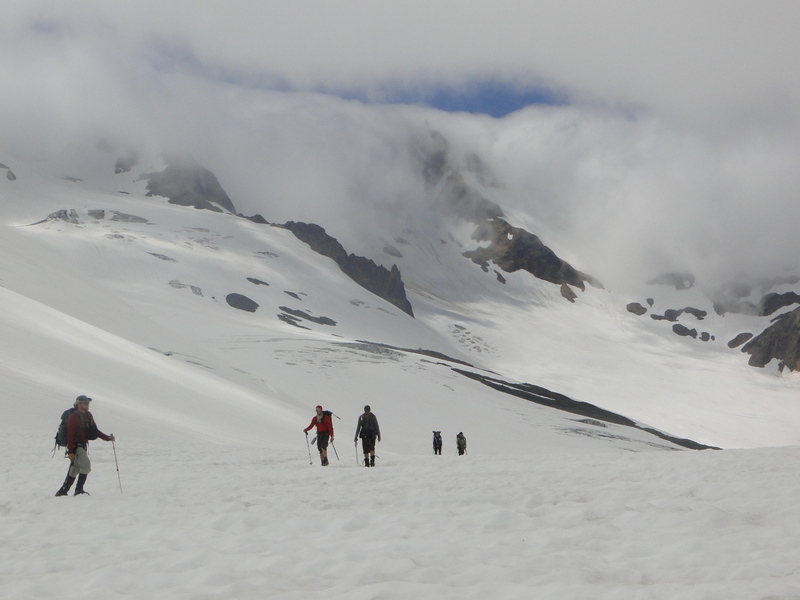 In 2010 we descended from its divide with Rainbow Glacier at 2100 meters to just above the terminus. 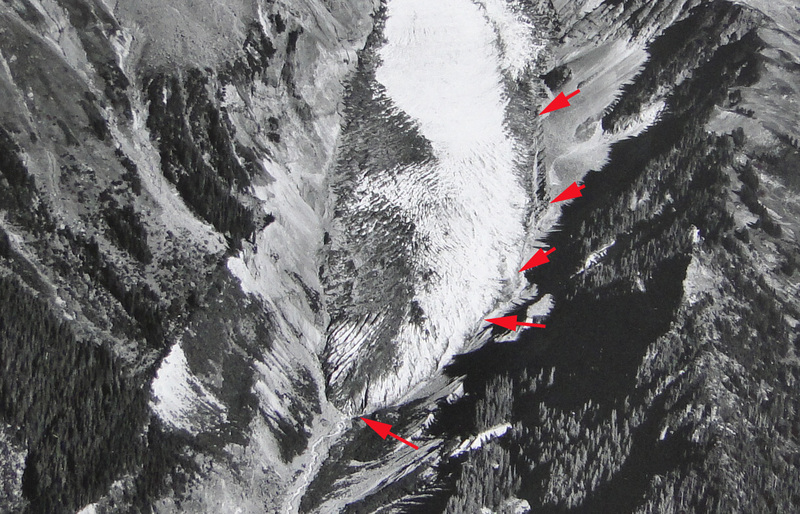 In the 1970’s the USGS map (top image in sequence) indicates the terminus extended down valley to 1200 meters, this was after a period of advance for the glacier. The glacier advance 450 meters from 1950-1980 (Pelto and Hedlund, 2001). In 1987 we observed the glacier to have begun to retreat. By 1993 the glacier had retreated 200 meters. 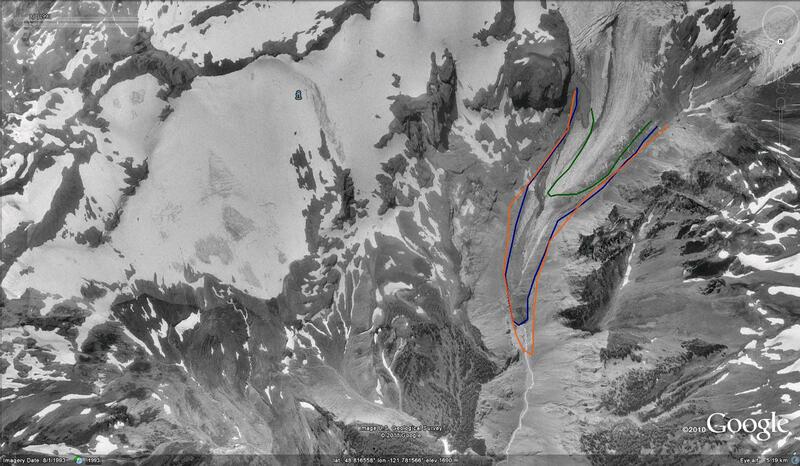 From 1993 (middle) to 2009 (bottom image) the glacier retreated an additional 750 meters. 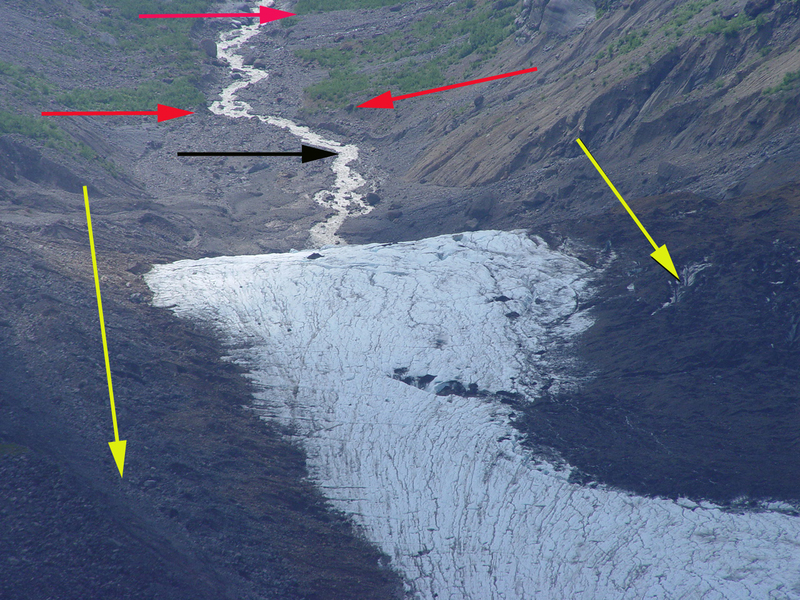 The rate of retreat has been higher for this glacier because of the loss of the low elevation debris covered terminus that had existed from the 1950’s-1990’s. The glacier is still heavily crevassed and active. The retreat will continue as indicated by thinning near the snowline of the glacier from 1993 to 2009. 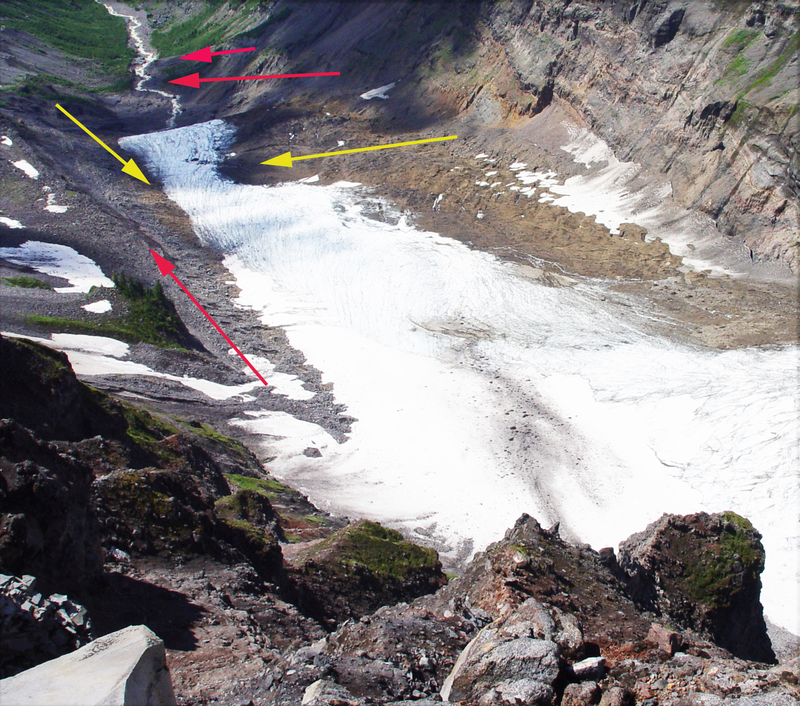 Note the expansion of the rock outcrop in glacier center (A) from the top image, 1993 to 2009 bottom image. There is also considerably less crevassing near Point A. 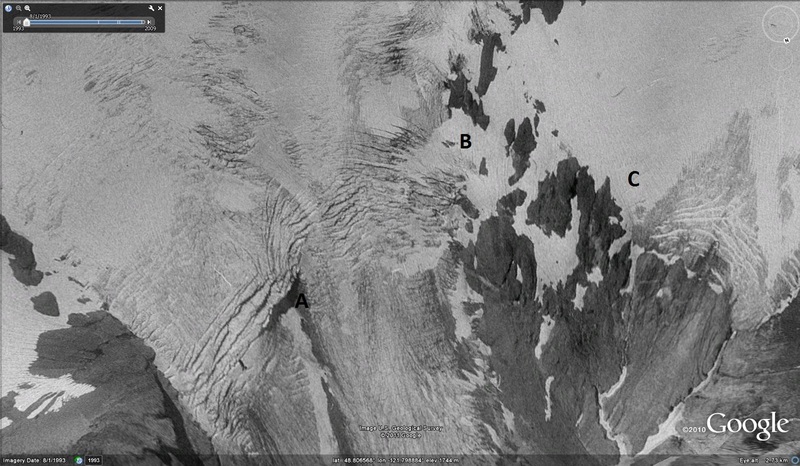 Also note the stranded glacier ice at Point B and C in 2009. This loss has been due to 7 of the last 10 years having a snowline that rose above the elevation necessary for equilibrium. In 2009 at the end of the summer just 36% of the glacier was snowcovered, 65% needs to be snowcovered for equilibrium. . In two weeks we will be visiting Mazama Glacier again. 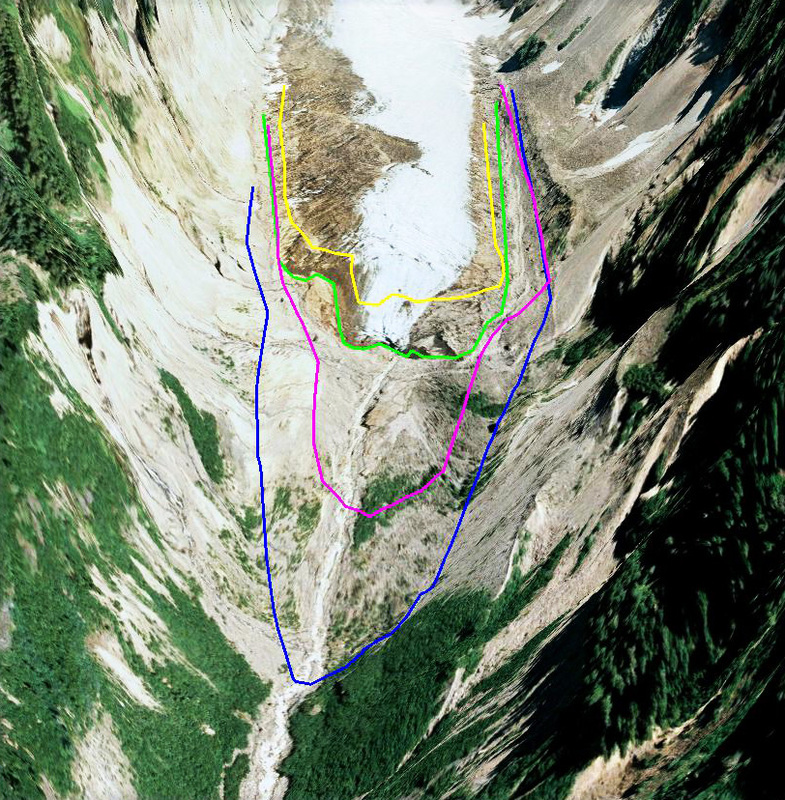 Given the heavy 2011 snowpack it is unlikely we will get to see the terminus which should be under avalanche debris.